The beauty of the Unity family is its ability to fill functional, institutional spaces with comforting light and organic lines. 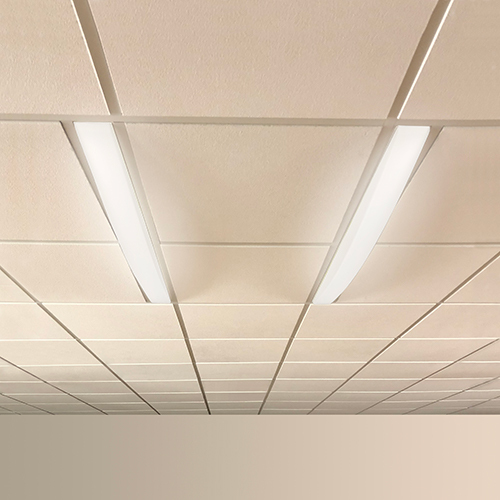 Now Unity offers even greater flexibility with these narrow luminaires that retain the warm, cloth-like style as dual overbed slots. Designed to provide visual comfort in healthcare spaces, our Unity family is multitalented, with table lamp, wall sconce, headwall, and single or tandem ceiling-mounted models. After brainstorming further with healthcare facility staff and healthcare specifiers, we've expanded the Unity family even further to include dual slot fixtures that can fit around overbed equipment without dominating plenum space. Logistically, Unity dual overbed slots contain the same high-performance multifunctional light as their siblings, including reading, ambient, and exam lumen levels. Now they also include optional 2-channel tunable sources. They are made with easy to clean acrylic diffusers and antimicrobial finishes on painted surfaces. Where exceptional lighting design is concerned, Unity's diffusers have a comforting, fabric-like glow and gentle sloping lines that mimic the natural effects of gravity and wind. Our patient-centric approach to design and collaboratively engineered features ensure these Unity slot luminaires are truly unmatched. Take a look at Unity dual overbed slots at #LFI2018!